This recipe was the product of a series of tests to determine the best direction for a brilliant fluid-melt transparent base glaze for copper blues and greens. Once I selected a specific recipe (Panama Blue), I removed the colorants and made adjustments to improve its slurry properties and lower the thermal expansion to stop crazing. 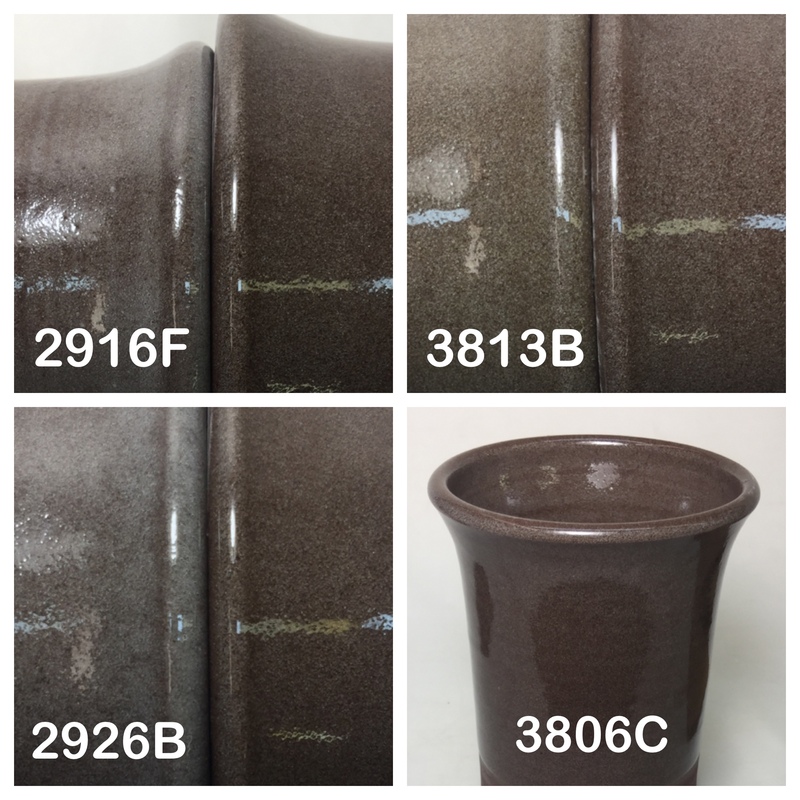 This type of base glaze is needed because more stable transparents lose their gloss on brown bodies and when certain colorants are added. Fluid melt base glazes also produce much more interesting visual effects. But of course, they have a down sides: they can run off the ware onto the shelf if too thick! And they have an inherently higher thermal expansion so crazing is more of an issue (but it is not impossible to solve as you will see here). This recipe is just the base, it does not have the copper and tin to make the green color. We recommend using Copper Oxide, between 1 and 1.5% (depending on the intensity of color desired). While the previous version, B, did not craze in my tests, its calculated thermal expansion was high enough to be a cause for concern. This adjustment lowers the expansion further while keeping the same brilliant visual appearance. Two materials have also been eliminated from the recipe (their oxides supplied by the others). The chemistry of this one has reduced high-expansion KNaO and increased low-expansion MgO. This makes it melt a little less, but visually it is the same. The higher ZnO seems to help melt the extra SiO2 I also added. As a result the calculated thermal expansion has gone from 7.7 down to 7.3. If this crazes on your clay body then consider trying a body that has a higher percentage of silica (25% would be good). 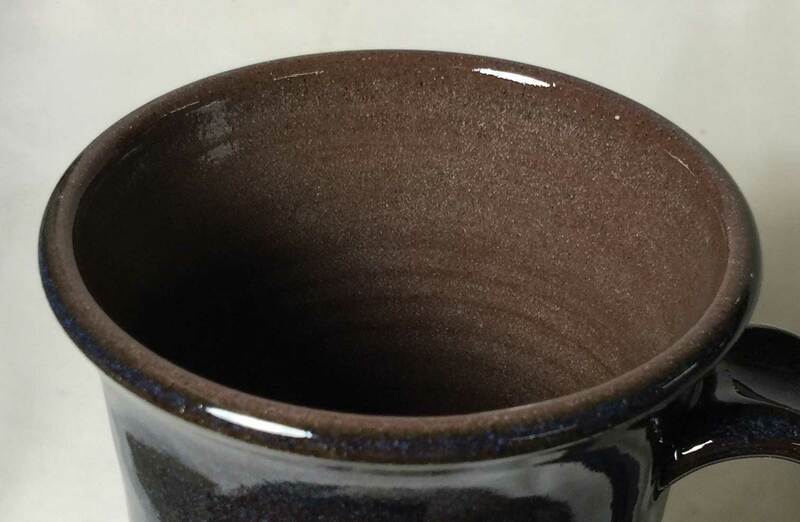 It is likely possible to adjust the recipe of this glaze to hang on to the fluidity while having a lower thermal expansion, but I have not done that. It crazes on Plainsman P300, M370 but appears to be OK on Polar Ice. Right is G3806C, an adjustment to drop the thermal expansion of B. It does this by trading some of the high-expansion KNaO for a mix of MgO, ZnO and SrO. These is an improvement but it still could craze over time on high-kaolin or low silica porcelains. One more change: The one on the right uses 2% Copper Oxide instead of 2% Copper Carbonate (left). Both also add 2.5% tin oxide. Strangely the color is only slight darker (the oxide is a more concentrated form of copper than the carbonate). This is the G3906C base plus 2.5% tin oxide and 2% copper oxide. The green glaze does craze over time on these bodies, but the inside glaze is a liner than will not. 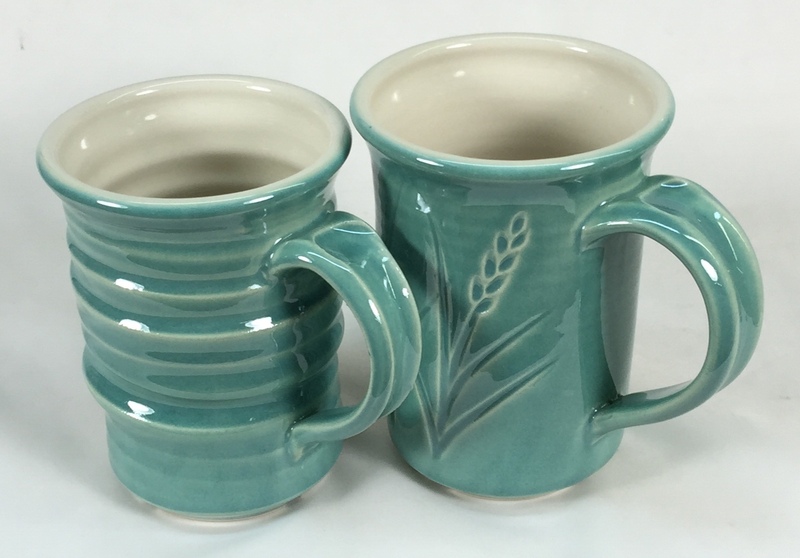 Each pair of mugs shows a numbered glaze vs. G3806C on the right. The body is a red burning cone 6 stoneware, Plainsman M390. Bottom right is P300 with three coats of C11. Bottom left: 10 gram ball of C11. 2926 B is top left, 3806C is top right. 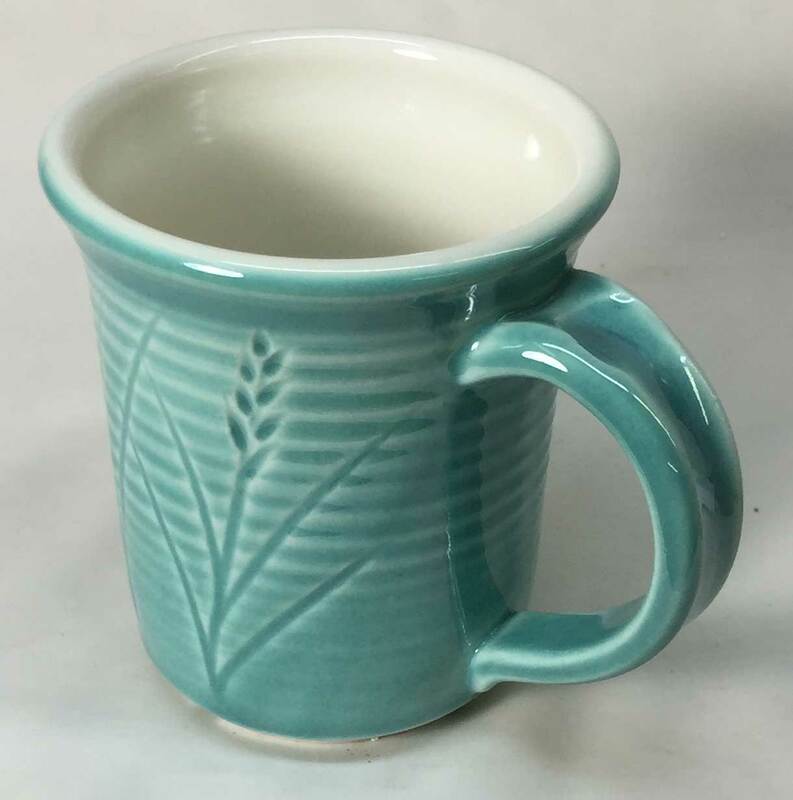 Polar Ice is the easiest of Plainsman middle fire porcelains to fit a glaze to, although this glaze crazes on most other porcelains, it should stay craze free on this. Plainsman M390. There is still some clouding, but it is better than other transparents we have used. Fire fast to 2100F (300-400F/hr), then 100F/hr to 2200F, then drop fast to 2000F and soak half hour, then cool at 100F/hr to 1400F. This is the standard cone 6 whiteware clear base glaze made by Plainsman Clays. Mix it at the proper specific gravity and gel it correctly to get a very workable slurry. Search "G2926B" at https://plainsmanclays.com for mixing-with-water info. 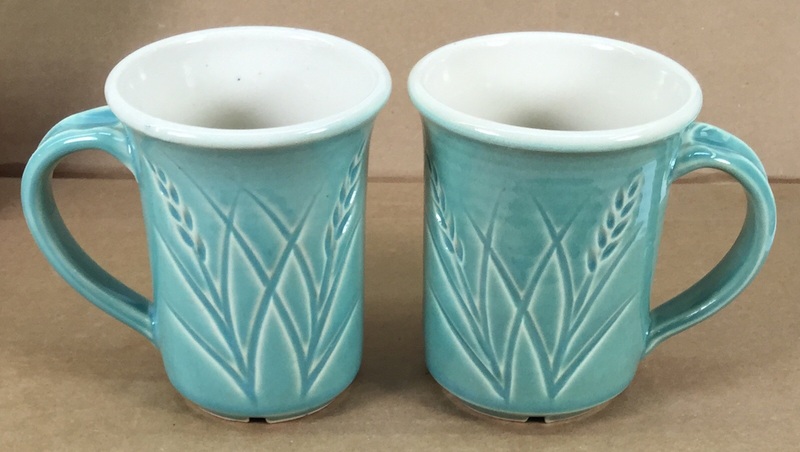 The page for this glaze at the Digitalfire Reference Database also has lots of pictures and notes (see link below). This recipe is a descendent of Perkins Studio Clear. It sources boron from a frit instead of Gerstley Borate and adds 10% silica. The recipe totals 110 for this reason (this is not an issue, just recalculate to the total you want). This recipe has very high Al2O3 and SiO2 content yet still fires smooth and glassy. Notwithstanding this, it begins to melt below cone 02. On porcelains the cone 6 surface is brilliantly glossy and fires without defects. This glaze may not have enough melt fluidity to pass bubbles on stonewares that produce excessive gases of decomposition. This responds to moderate additions of most stains to produce homogeneous colors that bleed very little. 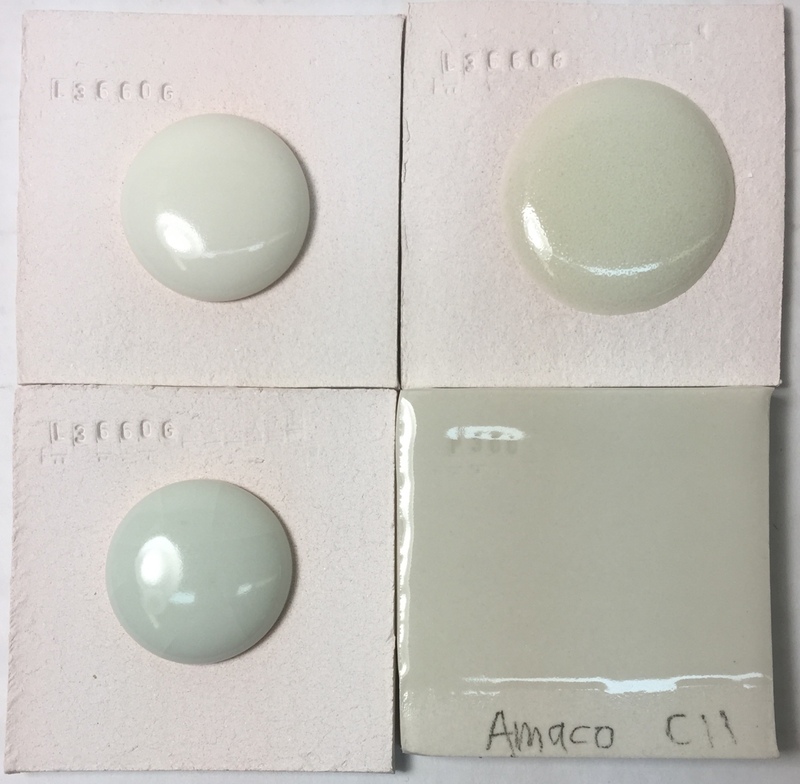 But again, because this glaze does not have high melt fluidity certain colors, or high percentages of colors, can produce surface defects and matting.